Nuacht Eile / Other News: Reminder: Calling all Knitters – Blankets of Hope are back! Reminder: Calling all Knitters – Blankets of Hope are back! You may remember last summer we presented an amazing 5 blankets to the Girls Club Cork which they gave to children as comforters as they undergo chemo. This charity provides help in many ways to anyone who is undergoing chemo. 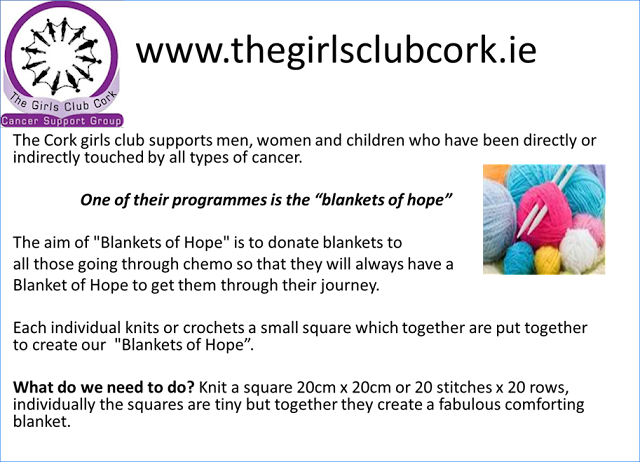 This year we are hoping to help more children and so our 2nd to 6th class will be taking part in the "blankets of hope" programme where each child will be taught to knit, and then the square sewn into a larger blanket.